Tag line: "2 1/2 Years in the making!" 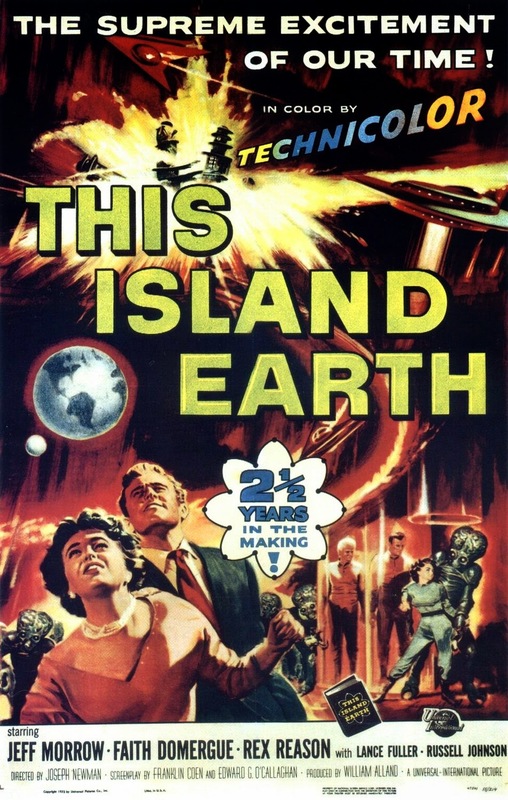 For their 1996 feature film debut, the gang at Mystery Science Theater 3000 took aim at a ‘50s sci-fi movie titled This Island Earth, and, on the whole, did an outstanding job lampooning it. But unlike many of the flicks that Mike and the ‘bots have ridiculed over the years, This Island Earth is actually a decent motion picture. After constructing a strange communication device sent by persons unknown, Nuclear Physicist Cal Meachem (Rex Reason) is contacted by a mysterious man know only as Exeter (Jeff Morrow). Without offering an explanation, Exeter asks Cal to join him at an undisclosed location, an invitation the curious scientist quickly accepts. Once there, Cal finds himself in the company of some of the world’s most brilliant minds, including his old colleague, Dr. Ruth Adams (Faith Domergue). Teaming up with fellow researcher Steve Carlson (Russell Johnson), Cal and Ruth try to figure out who Exeter is, and why he’s gathered them together. This Island Earth gets off to a good start, building a perplexing mystery that Cal is anxious to solve. Aided by his assistant, Joe (Robert Nichols), Cal passes Exeter’s “test” by successfully building an interocetor (the above mentioned communication device), gaining him acceptance in Exeter’s scientific fraternity. With their large, protruding foreheads and bright white hair, its obvious Exeter and his accomplice, Brack (Lance Fuller), aren’t from around these parts, but the question remains: who are they, and what are they after? This Island Earth does eventually answer these questions, at which point it becomes a thrilling sci-fi adventure, featuring vibrantly colored set pieces, impressive costumes, and some pretty nifty special effects. While I definitely recommend Mystery Science Theater 3000: The Movie, I suggest you first watch This Island Earth in its original form. An imaginative, well-made film, This Island Earth is a rarity in that it’s every bit as good without the MST3K commentary as it is with it. Along with It Came from Outer Space - another good film - this was one of the first Sci-fi movies I saw as a kid, and it sticks in my memory. The suspenseful ending with the stowaway alien drone presages what will come decades later in the Alien and Aliens films. Very entertaining from the mysterious visitors to the trip to the planet being decimated by another race of aliens, to the climactic ending. There's a scene when Exter, Cal, and Ruth are on the planet Metaluna in the Monitor's chamber, and for some unknown reason their skin turns blue! Have you seen this?